Format of rejection letter to a student who has applied to your school and has not been accepted by the school board on the basis of not meeting the eligibility criteria for Bachelors. We have received your application for admission to the Bachelor of Science (BSc) program at the Belleville Institute of Technology. We thoroughly review all our applications according to our admission criteria which can be found at our website. After a review of your academic history, we regret to inform you that you do not meet the criteria to enter the BSc program. You may apply again before the start of the next semester in December; in the meantime we suggest you redo any courses in which the merit did not fit our criteria. We received your application for admission for entry in the Psychology program. Unfortunately, based on the number of high applications, we cannot offer you admission into the program. In addition to this, you also do not fulfill our admission requirements on the basis of which we could not put you on the waiting list too. The letter of rejection has been attached with this email which contains further details. You may contact me for any further clarification. 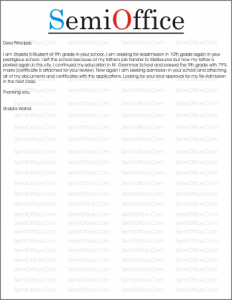 Sample format in recommendation letters to student who will be going off to college next year. As these students have devoted a a huge time of their life to an institution learning and growing up in it, there is not person more suitable to write them a recommendation letter than a teacher who knows them so well. I am a professor who has been teaching students at BeaconHouse School for the past ten years. I am writing to recommend a student, Tyler Hall, who has shown exceptional capability in performing his tasks as my student. In our class of roughly three hundred students, Mr.Hall has achieved one of the highest merits in the A levels of our class. Mr. Hall is extremely hard working, and has never missed a day of class; except due to certain family emergencies. He is very well-mannered and does not complain or start any issues if asked to complete a task. I believe that both merit and personality go hand in hand – and this student of mine has demonstrated remarkable qualities in all. For all the reasons stated, it is therefore that I strongly recommend allowing this student to go to this college. I believe Mr. Hall will be a unique student who will never disappoint, will perform his tasks on time and without question, while showing great knowledge of all subjects. I hereby formally recommend Tyler Hall to this college. Sample application letter for installment of fees in college or university due to low income of your father, mother or guardian etc. Sir, I am a Mr. Mark Noble and I have been selected at your prestigious college for mechanical engineering. I am very impressed by the effort all the teachers put in to make our future better and that is why I applied at this college. I have topped my school with a margin and I have been a hard working student throughout my entire school life. My father drives a cab here and he is working day and night to make sure that I get quality education. Last week, thieves broke into our house and stole all our savings. My parents have been very depressed by that because that has risked my chances of getting quality education. Therefore, I would like to request you to grant me the opportunity of paying my admission fees in installments. I guarantee that the fees will be paid before the due dates given. I will not let down the name of your institution or my family. I shall be very thankful to you. Refer to the meeting we had yesterday in your office regarding the payment of college fee for admission to the ICS program. As requested, I would like to pay the fee in three equal installments for which you have already promised to consider the application. I will be highly thankful in this regard because my son has a brilliant career record and unfortunately my business is not flowing all that well. Please support us so that our son’s education can be continued without any hindrance. Application letter for Request to postpone the fee payment date. I am John and I am student of this college for past two years. Sir I am writing this letter to bring this to your kind notice that I have some financial issues at home and I will not be able to pay my fee in time. Sir I am a very good student and I have never submitted late fee. This month there is some serious issue at our home and I will be late in paying my fees. Sir this is a very kind request that please change my due date for fee submission and move the date 2 weeks later. Sir this will be a huge favor and I will be very grateful to you. 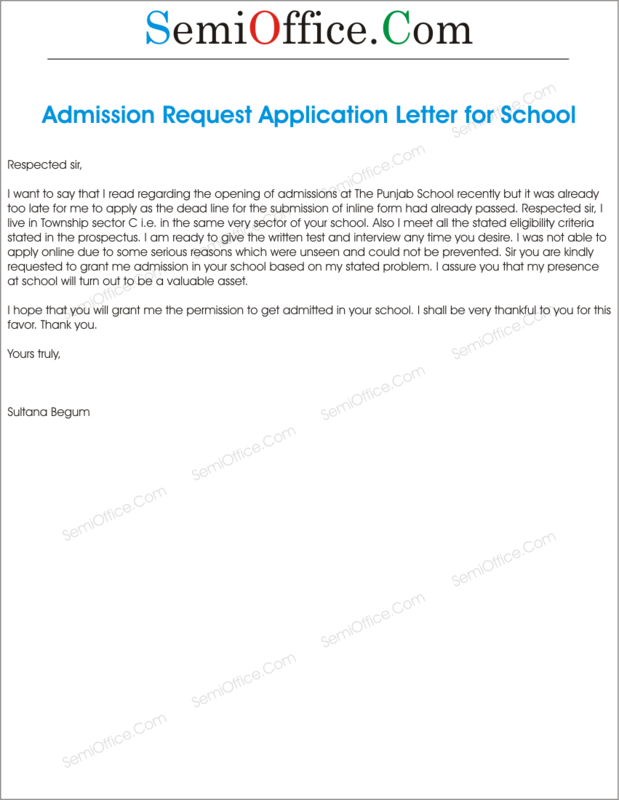 Sample letter to students who submitted the admission form for informing them about the confirmation of their admission in school, college or university and academy etc. This is Jenny from Computer department Harvard University, I want to congratulate you that you have been qualified for BCS Admission, and you are requested to contact the administration department for further process. Your first semester classes will start on 1st of December. Kindly meet the concerned person for fee structure, and course details, etc. You are among those lucky people who have got the chance to study in such renowned university. Looking forward to your action against this letter and hope that you will contact us as early as possible. We would like to inform you that you have successfully passed the entrance exam for BS in computing, and you have secured a seat in our department. You have all the rights to be happy for being a part of our institute. We would like to tell that the fee must be submitted by the given dates in order to reserve your seat. We wish you a good luck, looking forward for your arrival. I am very happy to break the news of your admission confirmation. You have scored well in the entrance exam and have wonderful educational background. Many students have a desire of getting admission here but only those got admission which meets our criteria. Our institute will be pleased to have you and students like you because the future of our country belongs to you. I have attached all the other necessary details along with the application. Once again I must want to congratulate you and your family. Sample leave application for admission in college for further education or admission of your brother in college, school, university. As per your advice, I am looking forward to improving my qualification. Luckily, Punjab University is offering weekend classes for MBA. To take admission in this degree program, I request you to kindly grant me half leave for today i.e. on 17th August, 2015 so that I can visit the campus and fill out my admission forms and get enrolled in the university. I am Raja Muzaffar, working as Senior Accountant writing to request one day leave to go with my daughter for her admission in college. Recently she passed her matriculation examination and now she is seeking admission in Fsc Pre-Engineering. Tomorrow she wants to go to college for submission of admission form, entry test as she already bought the prospectus. She asked me to give her company and support for all the admission process. I request you to please grant me leave for tomorrow. I will be Thankful to you. It is stated that Aqsa High school is considered to be the best school in town due to its qualified teaching staff & best syllabus for students. The school has maintained its worth in getting top positions in board. Keeping all these arguments in account, I have decided to select this school for my children. I have submitted the application forms of my 2 daughters for class 4 & a son for class 8. They have appeared in entry test which is successfully completed. I request you to please grant them admission in your school so that they can have quality education, personality development here. I will be looking forward for your positive response in this regard. Most respectfully, It is requested that I want to carry on my studies after HSSC. For this purpose the community college has announced the admissions in the undergraduate programs. As the last date to apply is approaching, kindly grant me leave tomorrow from school so that I can complete the procedure and applications for the college in time. It would be a favor to me. 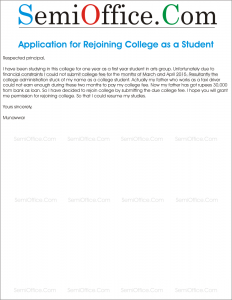 Sample application letter to principal, headmaster or director for rejoining the school or college after you have been expelled from the college due to shortage of monthly fees by college administration. 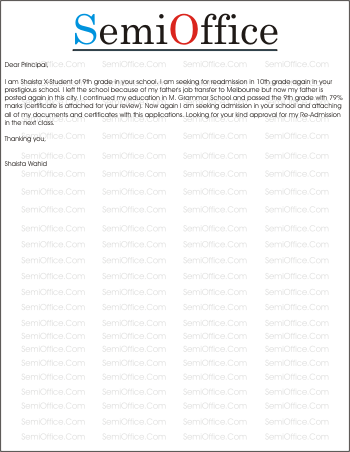 Sample letter to principal for readmission is available below after your admission was cancelled. It is respectfully stated that I, Mr. Smith S/O Mr. Fleming have been studying in your college in class xi in the two months back. My family wanted to send me in my uncles home in other city for my studies. So then I got my college leaving certificate from here and went to that city and got admission in a college. But due to some domestic reasons my parents have called me back now. And now I want to rejoin your college in the class XI. College leaving certificate is enclosed here with. A sympathetic action is requested please. I have been studying in this college for one year as a first year student in arts group. Unfortunately due to financial constraints I could not submit college fee for the months of March and April 2015. Resultant the college administration stuck of my name as a college student. Actually my father who works as a taxi driver could not earn enough during these two months to pay my college fee. Now my father has got rupees 30,000 from bank as loan. So I have decided to rejoin college by submitting the due college fee. I hope you will grant me permission for rejoining college. So that I could resume my studies. I beg to state that I was studying in your institution as a student of Masters in psychology, last year. On account of unavoidable circumstances, my family and I had to move to other city and I did have to leave the college. As we have again come in this city and I need to continue my studies by rejoining the college with your permission. It is therefore requested that permission may please be granted to rejoin the college so that I could continue my studies. We hope this letter finds you in best of your spirits. This letter is intended to reimbursement of your dedications to The Fusion College. We appreciate your direction to this institution and leading it to the peaks of excellence in the field of education by maintaining the standard and quality of education. We shall be very honored if you rejoin the college at your first ease. It would be considered as an addition in your accomplishments to this college and in the best interest of this institution that flourished this far under your direction. You are invited to reply this letter in first of your spare time. We shall be waiting for your response in this regard. I am a student of your college since 1 year. I have passed my 1st year of FSC from your college and got scholarship in my class. But unfortunately in my 2nd year of FSC, i have to suffer some circumstances. My father got a serious accident and had been admitted in the hospital for 8 months. Therefore, i have to join a job for my father’s treatment and to meet other …. During this I couldn’t afford my college fee so therefor, i had delayed my study for some time. Now, with the mercy of ALLAH, my father has gotten well. Dear sir, now I want to rejoin the college and complete my study and also can afford my college fee. I have a good record of my study in your college. I got scholarship in 1st year. I was also the C.R of my class. I participated in many others activities. I made my college team the winner of city in cricket matches. I always tried to increase the honor of my college. I request you to allow me to rejoin the college. I hope you will pay heed on my record and situation. It is honorable to me if I rejoin my college and complete my study. 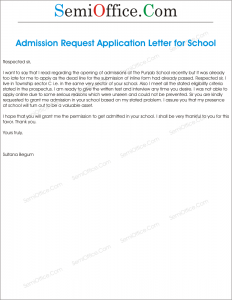 Sample application letter to principal or head master for requesting admission in school, college after the admission date. This letter is to request an admission in your institute. I have completed my secondary education from National Secondary School. I have attained six As and two Bs. I have always been an outstanding student not only in my studies but also in Co-curricular. I had served as basketball team captain and head of debates society in my secondary school. I request an admission in your institute to complete my Higher Secondary education. I assure you that I would study with the same hard work and determination. This letter is to request for my admission in your college. I have scored A grade in my higher secondary education and to further study I want to take admission in your institute. I have always been a brilliant student and thus want to carry on my studies in a well-known college with great teachers. This would not only enhance my skills but would also prove helpful in future as it would be stated on my CV. So to become a good person with perfect education I request my admission in your college. I want to say that I read regarding the opening of admissions at The Punjab School recently but it was already too late for me to apply as the dead line for the submission of inline form had already passed. Respected sir, I live in Township sector C i.e. in the same very sector of your school. Also I meet all the stated eligibility criteria stated in the prospectus. I am ready to give the written test and interview any time you desire. I was not able to apply online due to some serious reasons which were unseen and could not be prevented. Sir you are kindly requested to grant me admission in your school based on my stated problem. I assure you that my presence at school will turn out to be a valuable asset. I hope that you will grant me the permission to get admitted in your school. I shall be very thankful to you for this favor. Thank you. It is humbly stated that I have recently passed my A-Levels examination (pre-medical) and secured A+ grades in all subjects. It is my ambition to get admission in a medical college and be an honest doctor whose aim is to serve humanity not just earning. As my grades of education fulfill the requirement of your college to get admission therefore you are requested to please give approval for admission in medical course at your college. I assure you that I will prove myself a bonafide student of your college. Last year I applied for the admission of my daughter here and despite her clearing all the entry test questions you stated that she is still two months younger to be a part of the Montessori of this school. This year she fell sick around your admission test round and now the deadline has passed what I wanted to ask is there any chance that you would consider her previous mark sheet and would qualify her to the interview rounds for admission in this fall. I hope you will look keenly into my application. Waiting to hear back from you soon. 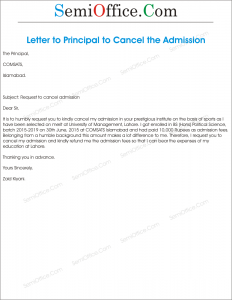 Sample application for cancellation of admission in school, college or university for any reason like shifting house, going abroad, refund of fees etc. It is to humbly request you to kindly cancel my admission in your prestigious institute on the basis of sports as I have been selected on merit at University of Management, Lahore. I got enrolled in BS (Hons) Political Science, batch 2015-2019 on 30th June, 2015 at COMSATS Islamabad and had paid 10,000 Rupees as admission fees. Belonging from a humble background this amount makes a lot difference to me. 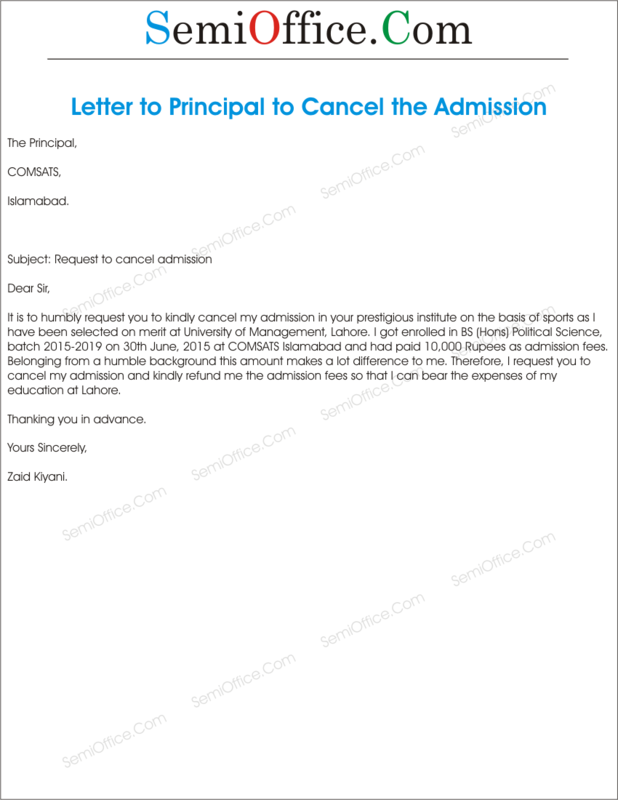 Therefore, I request you to cancel my admission and kindly refund me the admission fees so that I can bear the expenses of my education at Lahore. I am Justin recently get admission in Master of Business Administration and submitted all the dues according to fee challan issued by the department. Unfortunately my father passes away just four days back and I am the elder one in my family. Now I have to fulfill all the responsibilities and needs of my familly in the absense of my father. My family already depends on very limitted resources and my father was a doing a private job and provided me university fees by borrowing money from his friend. Now it is my responsibility to payoff the borrowed amount and I request you to please refund me all the dues I have deposited. I am enclosing copies of challan form and deposit slips as reference and provide you the original if needed. Looking for your kind approval for fees refund. With due respect, it is stated that I, Mahrukh Irfan, roll number F15MPSY007, a student of MPhil Clinical Psychology at Kinnaird College for Women has been offered admission at the Punjab University for MS Clinical Psychology program. I want to pursue my postgraduate studies from PU and therefore, request you to kindly cancel my admission at Kinnaird College for Women. All my dues for this semester are clear and there are no outstanding payments on my behalf. Kindly do the needful. I am writing to you about the college tuition and hostel fees that I paid a year in advance, as this was required. However I would like to request that I get a full refund back as I left after one week. The reason I left was due to the college course not being what I thought it was and I didn’t enjoy it. Please I would much appreciate if I could get the refund. It is stated that I applied for admission in your school for my son. His classes are scheduled to start in the next week. However, I had also applied for his admission in a nearby school. Fortunately he got accepted in the respective nearby school yesterday. I would now request you and the concerned management to kindly cancel the admission of my son and return the security fees as decided in the contract. With due respect it is to inform you that you have missed the last date of fee submission for MBA program. We also have sent you a prior notice. As now you have not submitted the fee therefore your admission has been cancelled. If you want to join us you have to apply again after 6 months for our Spring admissions. We wish you all the best for your upcoming life. 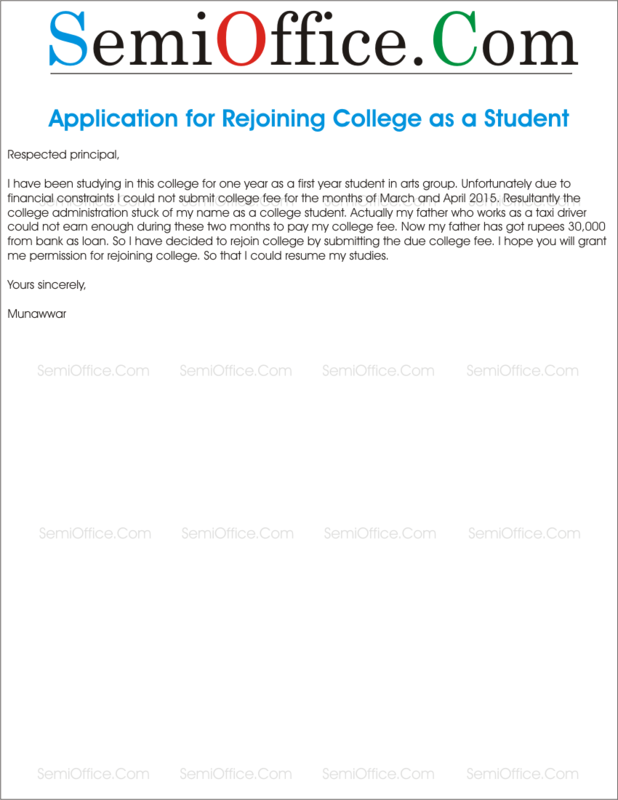 Sample application letters for readmission in school, college, university, academy for students. These readmission applications are for principals, coordinators, directors of the institute. I want to say that my admission had been cancelled in your school due to some unwanted circumstances. I want to request a re-admission in your school to resume my previous position as a student. Please provide me with the permission for a readmission. I shall be very grateful to you. I am Shaista X-Student of 9th grade in your school. I am seeking for readmission in 10th grade again in your prestigious school. I left the school because of my father’s job transfer to Melbourne but now my father is posted again in this city. I continued my education in M. Grammar School and passed the 9th grade with 79% marks (certificate is attached for your review). Now again I am seeking admission in your school and attaching all of my documents and certificates with this application. Looking for your kind approval for my Re-Admission in the next class. I am Arfa Kareem student of A-Levels in your school. I was sick and doctor suggested me bed rest of one year and advised to avoid walking, running etc due to pain in my backbone. Now I am recovered and last year I left the school after submitting a leave application for sickness. Yesterday doctor allowed me to go to school and now I am seeking readmission again in same grade of your school. Kindly accept my application and all the medical reports from doctors and hospital are attached for your review. I am Rafay student of MBA first semester of last session. Due to some very serious domestic issues I couldn’t appear in the final examinations of my first semester. Admission office told me that I need readmission with the approval of Head of Department. Now I am seeking for readmission in the University again for upcoming session. Please allow me to apply for readmission on merit basis and to appear in the admission test. Looking for your kind remarks for approval.